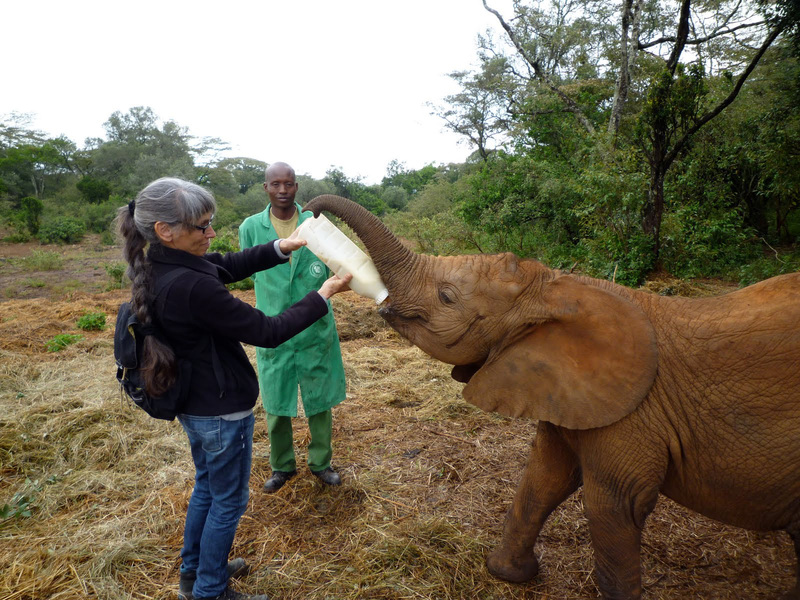 Coco Hall of Sausalito has a passion for helping elephants. Recently, she, along with her son, a former neighbor, and two fellow elephant-lovers, traveled to East Africa to learn more about wild elephants and gorillas and see them for the first time. Originally we were headed to Africa, Kenya and Rwanda, with the ultimate goal to see wild elephants and gorillas, however, thanks to lots of travel books, we found out that East Africa offers so much more. I traveled with an amazing group including my son, Ash Anderson, my former Sausalito neighbor, Andy Upjohn, and our friends Joyce Poole and Petter Granli, the directors of ElephantVoices. Joyce grew up in Kenya and speaks fluent Swahili, and is an elephant expert. She has studied elephants for over 30 years, and has discovered that elephants use powerful calls to communicate over long distances, the ability of elephants to mimic sounds made by other animals and machines, and the production of calls below the level of human hearing, to name a few. We stopped at the baby elephant orphanage at the David Sheldrick Wildlife Trust outside of Nairobi. If you think puppies and kittens are the cutest, you haven’t seen a herd of baby elephants. We walked right into the pack and were pushed, shoved, slapped, sniffed, and sucked on. The babies are given a keeper as a surrogate mother, which seems to work. Almost all of them eventually return to the wild. I adopted a baby on the spot. You too can adopt a baby elephant online. There are people all over the planet trying to help captive Elephants, including Joyce and Petter of ElephantVoices.org, whom I was lucky to work with. Meeting the people of Africa, such as the Maasai, and seeing and appreciating how they live was very touching. On a walk through a rural “neighborhood” on the edge of the Rift Valley, we came upon a group of a dozen or more children aged 2-14 who were singing. The oldest, a young teenage girl said they were singing because they were happy. They asked us to sing a song for them. The only song that we all knew was a sad Beatles song. They were not impressed. However, I think we did a little bit better singing Mary Had a Little Lamb with a rock beat. The encounter gave us all a feeling of happiness. I guess it can be contagious. Rwanda was the real surprise of the trip. I scheduled only three days there thinking it would be scary and unpleasant. On the contrary, it was clean (they have one day a month where everyone in the country, said our guide, including the president, goes out and cleans the streets and countryside. It appeared to be true.) The roads were good and the terraced farms and houses all neat. I loved the fabric the women walking along the roads wore, and on the way to the airport, we suddenly were in a dusty place with people and scooters packed all around our car. We said, “where are we?” and were told, “You said you wanted to buy fabric, we’re at the market.” This was not a tourist market, but it was vast, and sold basically everything. There was a building full of spectacular fabric and I spent our allotted 15 minutes bargaining for as much as I could fit in my bag. However, not everything in Rwanda is beautiful fabric and magnificent marketplaces. If you go to Rwanda, you will not want to miss the Genocide Museum, a beautiful yet sad place where hundreds of thousands of people are buried and you will be told about genocides. Be prepared to cry. During our trip, we very much enjoyed spending five days on the east coast of Kenya in Lamu, a very early Asian trading city and Unesco Heritage Site. The Swahili and Arabic cultures merged over the centuries and are now inseparable on this tiny island of no cars, winding streets, 5.a.m..call to prayers, women in burqas and donkeys everywhere The museum and Swahili House Museum are small and unsophisticated and not to be missed. Lamu is surprisingly unscathed by tourists. We also went on a boat trip there. The boat was a refurbished dhow, a traditional Indian ship. We stayed south of Lamu, a 30-minute walk down the beach, or ten minute ride in a skiff, in Shela at Kitani House. Absolutely lovely. Although Africa is vey beautiful, parts of it, such as Nairobi, are dangerous. We never went into the city, but even the outskirts are unsafe. Houses have big fences, hedges, and armed guards. Other dangers present throughout Africa include malaria and some of the animals in the parks. However, with the proper precautions for malaria and well-trained, experienced guides in the parks, you should be safe. We had a bit of a challenge when hiking up a mountain. On the first day we hiked for two hours uphill in six inches of mud, in the rain and mist, surrounded by nettles with umbrella sized leaves and pickers to match. However, we had rain gear including rain pants, jacket and hiking boots, as well as hiking sticks. Getting there is easy but it’s 9,585 miles away. I flew to Amsterdam on KLM and stayed there for one night. I had just enough time to go to one museum and have one Indonesian meal. The next morning we continued on to Nairobi. We flew in country twice between Nairobi and the parks, and to Lamu. I enjoyed the drive to Masai Mara from Nairobi but after that, I preferred flying. We flew to Kigali from Nairobi, and made an unscheduled stop in Burundi. On the return, I flew from Kigali to Nairobi to Amsterdam, and finally ended up at SFO. It took 36 hours from end to end, no problem. We enjoyed staying at Basecamp Explorer, a super eco-friendly travel company. Their lodges are completely “green.” They have won the highest awards for their ground breaking ecological approach to travel, and they were Obama’s choice when he went to Kenya. We stayed where he stayed in Masai Mara. Their Wilderness Basecamp is beautiful and simple, on a special conservation area next to a safari guide school. In Amboseli we stayed at a gorgeous lodge, Tortillis Camp.We adored their great food, wonderful people, beautiful views, and comfortable “rooms”. In Nairobi, we stayed at the Karen Blixen Coffee Garden, which had beautiful rooms, a restaurant, a bar… it’s a “happening” place! We loved sitting with the owner, Dr. Bonnie Dunbar, at dinner. She is amazing, a contraceptive scientist who works with both humans and wild animals. This is a peak experience for all animal lovers. If you go to see the gorillas, definitely buy two permits each and go up at least twice because you never know what the results will be. For those of us who are mad about elephants and work to help them, especially in captivity, seeing wild elephants is a must. The contrast between even a superficial look at a captive elephant compared to a wild one (or herd) will be a learning experience that will buoy you on through years of often frustrating work. This entry was posted in Africa and tagged coco hall, elephants, ElephantVoices.org, The Elephant Sanctuary and PAWS Ark2000, travel with purpose. Bookmark the permalink. Loved the work you’ve done. The world needs more people like you. It must have been quite an adventure. It’s something that I would love to do as well. Your story has inspired me. What is more amazing is that you know Andy as well. I have in fact lost in touch with him. It’s great to see that he was with you and well. Please pass my regards to him if you hear from him. I have lost touch with him and would love to re-connect again.